What better time than now to start teaching kids about eating healthy, shopping for locally sourced produce, and the value and uniqueness of artisan produced products and crafts. Bring your kids out to the 4MRMarket, let them play hopscotch and make a huge chalk drawing in the kids area (designed and painted by the Alexandria Arts Commission). Then, invite your kids to lend a hand throwing together one of these three easy, summertime, tomato-based recipes! The heirloom tomato season is the perfect time to compliment your meal with a side or starter from everyone's favorite plump, sweet, and juicy fruit-vegetable 'tweener. And what could be easier for kids to start to cooking with than recipes calling for nothing more than a few slices of this and a dash of that. Voila! Delicious, fresh food. With a little adult supervision, teach your kids to slice tomatoes, sprinkle salt, pepper, oil and/or vinegar, and maybe, when they start getting a little better with the knife, how to chop an onion. Figure 3-4 slices of tomato per person. Make a small dice of sweet onions (or you can use the food processor on the onions to make a coarse chop). Fan the tomatoes on a plate, then sprinkle with salt, pepper, the sweet onion dice, and rice wine vinegar. 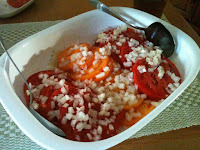 An amazing dish with good, sweet tomatoes. Again, figure 3-4 slices of tomato per person and an equal number of slices of fresh mozzarella. Next, make a chiffonade of 5-10 basil leaves (fancy French word for thinly sliced). Arrange the tomato in a fan with a slice of mozzarella between each slice of tomato. Sprinkle a generous amount fresh cracked black pepper, salt, and the basil. Drizzle extra virgin olive oil together with fresh squeezed lemon juice or (balsamic or wine) vinegar over the whole dish (1/2 to 1 tablespoon of each per tomato). Optionally, top with a few olives. 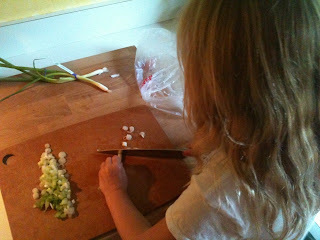 There's no reason a child can't learn this dish with a little supervision! This easy dish can be made all in a food processor or blender. This recipe will make about 6 servings, but is easily scaled up or down. Use 4-5 cups of diced watermelon, and about 2 cups of diced tomato. Throw that into the food processor or blender, then squeeze in 1/4 cup of lime juice, 1 tablespoon of sherry or white balsamic vinegar, and 1/2 teaspoon salt. Blend to combine, but you don't have to get everything silky smooth. Adjust salt to taste. You might like it a little more tart, as well, in which case stir in a bit more vinegar or lime juice to taste. Garnish with some chopped tomatoes. Enjoy! Pick up those tomatoes and watermelon at C&T Produce or Pleitez Produce. The salads go great with some corn on the cob and a tasty locally raised steak on the grill from Stifler Farm! he gazpacho could be a starter with any meal... or eat it along side a tasty garden salad for a light meal that doesn't require the stove or oven on a hot summer night. Remember to catch us early to beat the heat! We're open at 8am, before the summer sun cranks up the heat. Remember to check out all our great artisans! And chill out to some great jazz guitar at the 4MRMarket lounge as you enjoy breakfast or a snack from 9:30 to 12:30 tomorrow!